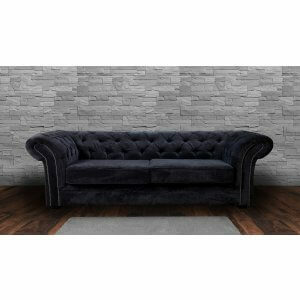 The great British sofa, believed to have been first created by the 4th Earl of Chesterfield and originally made from horsehair and off cuts of leather. Our chesterfields are made with a distinctive modern twist with deep buttoning secured to the frame and quality fabric upholstering. We have a wide range of modern styles and fabrics including linen effect, crushed velvet, chenille and premium bonded leather. •	Soft tufted chenille effect durable fabric that gives extra comfort. •	Wooden feet add a traditional style to this piece of furniture. •	Crafted in luxury fabric to create sofas of exceptional beauty. •	Foam filled backs and pocket sprung seating ensuring a supportive and comfortable sit. •	Hardwood frame providing great support. •	Fully compliant with UK fire regulations. In stock and delivery within a week. Last 2 items in stock - delivery within a week. Last item in stock - delivery within a week. •	Manufactured in a soft tufted chenille effect durable fabric that gives extra comfort. •	Nelson sofa showcases the vintage chesterfield style with deep buttoning. •	Hardwood frame providing great support. •	Wooden feet add a traditional style to this piece of furniture. •	Quality fire-proofed dense foam and pocket springs ensure a very comfortable seat. •	Fully compliant with UK fire regulations.